One of Marbella’s leaders in Real Estate based in Elviria, Residencia Estates, now has a treat in store for its many mobile visitors to their website: their all-new Mobile Site by OptimaSit. Just like their audience, their mobile site is available in multiple languages. German, Dutch, Spanish and English covers the majority of what their clients speak and understand. 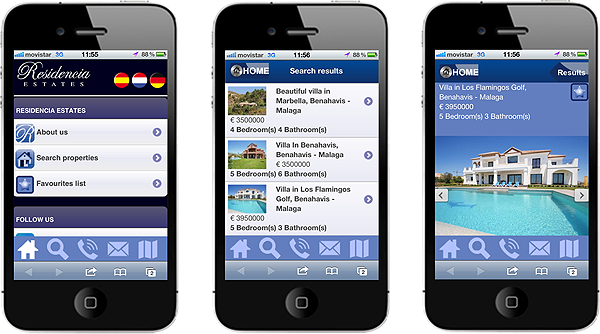 On this mobile site it is possible to find the property a client seeks, using a range of search criteria + the usage of proximity search allowing a visitor to seek and find properties of their likes within a set distance of their current location.